Wheems Farm is an ecological smallholding on the southern Orkney island of South Ronaldsay offering holiday accommodation and campsite. Sensitively landscaped with areas set aside for conservation, areas carved out with stone dyke walling and areas of tree planting. Facing south east on a hillside above sea cliffs and beaches, on South Ronaldsay, the Orkney Islands, Scotland. Wheems Farm Holiday Accomodation offers camping for over 19 pitches for tents and camper vans. Wheems Farm Campsite overlooks cliffs and sandy beaches to the south within 5 minutes walk. 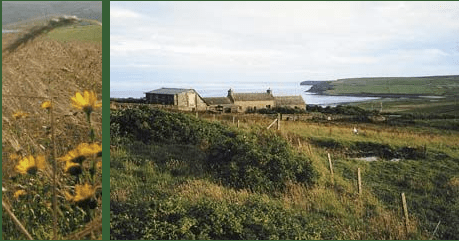 Wheems Farm is an ecological and organic smallholding on the southern Orkney island of South Ronaldsay offering holiday accommodation and campsite.